''My Edu Plan - Overseas Education Fair'' Planning to study abroad? New Zealand , Australia ,UK or Canada in 2018/19 ? 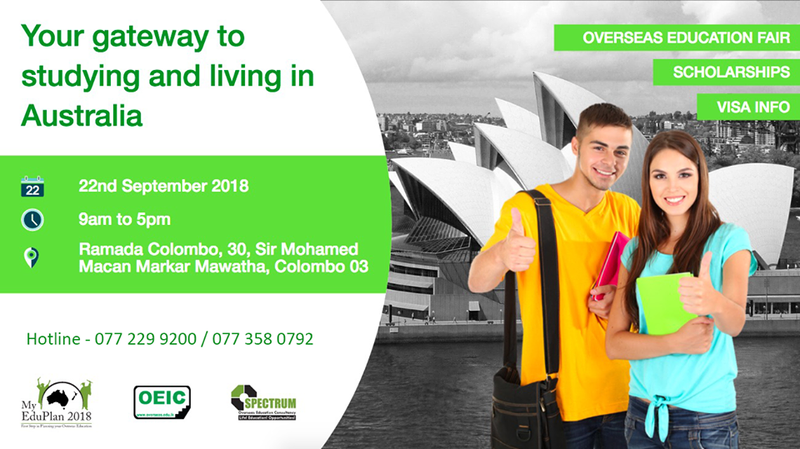 Step into 'MY EDU PLAN'' on 22nd of September,2018 at Hotel Ramada (former Holiday Inn) near Galle Face. #Free Entrance #Free Consultation Time: 9.00am to 5.00pm Call 0772299200/ 0773666019 For More Details Meet the Professionals And Plan Your Future Education Pathways. #OEIC #Overseas_Education_Information_Centre #SriLanka's Trusted Overseas Education Consultant.